Hydrochloric acid is a solution of hydrogen chloride in water, forming a very strong, poisonous, corrosive acid with a sharp odor. It is used in food processing, metal cleaning, and dyeing. Small amounts of hydrochloric acid are also secreted by the stomachs of animals for digestion. Hydrochloric acid was historically called acidum salis, muriatic acid, and spirits of salt because it was produced from rock salt and green vitriol and later from the chemically similar common salt and sulfuric acid. Free hydrochloric acid was first formally described in the 16th century by Libavius. Later, it was used by chemists such as Glauber, Priestley, and Davy in their scientific research. 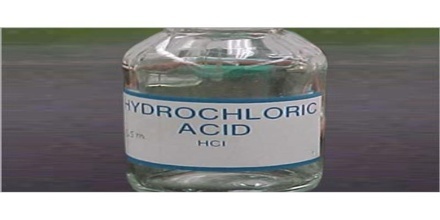 Hydrochloric acid is a strong corrosive acid that is commonly used as a laboratory reagent. Gastric Acid is the hydrochloric acid component of Gastric Juice. It was known to European alchemists as spirits of salt or acidum salis (salt acid). Both names are still used, especially in other languages, such as German: Salzsäure, Dutch: Zoutzuur, Swedish: Saltsyra, Turkish: Tuz Ruhu, Polish: kwas solny and Chinese: 鹽酸. Gaseous HCl was called marine acid air. The chemical formula for hydrochloric acid is HCl, and its molecular weight is 36.47 g/mol. It is the solution of hydrogen chloride in water, and HCl is used synonymously for both the gaseous form and the aqueous solution. HCl is a simple diatomic molecule, with a polarized covalent bond between the hydrogen atom and the electronegative chlorine atom. As a strong acid, HCl has a large Ka. Theoretical attempts to assign a Ka to HCl have been made. When chloride salts such as NaCl are added to aqueous HCl, they have practically no effect on pH, indicating that Cl− is an exceedingly weak conjugate base and that HCl is fully dissociated in aqueous solution. 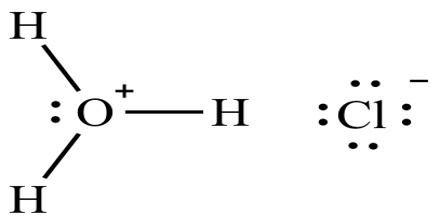 For intermediate to concentrated solutions of hydrochloric acid, the assumption that H+ molarity equals HCl molarity is excellent, agreeing to four significant digits. Hydrogen Chloride is available in many different concentrations in water, thus its exact physical properties (boiling point, melting point and density) vary accordingly. The concentrated grade is about 38% HCl in water. Industrial-grade HCl is about 30% to 35%, while the commercial grade (muriatic acid) is between 20% and 32%. Household cleaning solutions of HCl are typically 10% to 12%, but these still need further dilution before use. Hydrogen chloride is typically generated as the by-product from industrial scale production of other chemicals. It is also prepared industrially by the combustion of hydrogen in chlorine. Being a strong acid, it gets completely dissociated in water to give the hydronium and chloride ions. 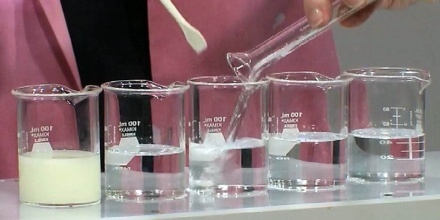 It readily reacts with bases to form chloride salts. 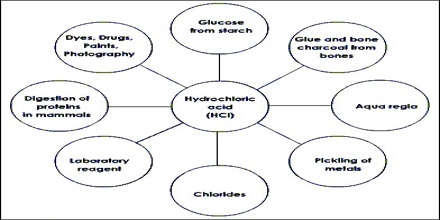 Hydrochloric acid has many uses. It is used in the production of chlorides, fertilizers, and dyes, in electroplating, and in the photographic, textile, and rubber industries. 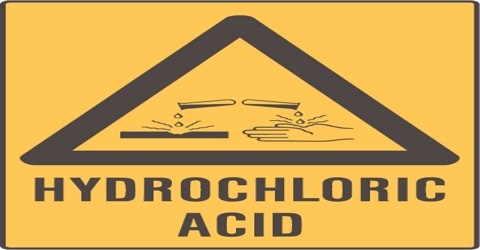 Hydrochloric acid is corrosive to the eyes, skin, and mucous membranes. Acute (short-term) inhalation exposure may cause eye, nose, and respiratory tract irritation and inflammation and pulmonary edema in humans. Acute oral exposure may cause corrosion of the mucous membranes, esophagus, and stomach and dermal contact may produce severe burns, ulceration, and scarring in humans. Chronic (long-term) occupational exposure to hydrochloric acid has been reported to cause gastritis, chronic bronchitis, dermatitis, and photosensitization in workers. Prolonged exposure to low concentrations may also cause dental discoloration and erosion. EPA has not classified hydrochloric acid for carcinogenicity. Reference: pubchem.ncbi.nlm.nih.gov, softschools.com, dictionary.com, wikipedia.